What I said was, “Yes, a brand can be built around a generic domain name, as demonstrated by the Hotels.com example. However, I don’t think a generic domain name should be used to rebuild a brand.” I agreed with Bodog’s decision to continue with the Bodog brand rather than buying a generic domain name, as Frank Schilling recommended. I think Bodog’s strategy is spot on, and not only are they not losing customers, all of the news surrounding this news story is certainly allowing Bodog to reach more customers. After reading all of the news events, people know what Bodog is, people know what Bodog does, and most importantly, people know where to find Bodog. The point of my blog post was that Bodog was smart to keep the Bodog brand, even though their original domain name was taken. On a side note, it’s great to see a CEO like Calvin take the time to blog. With few exceptions, company brands and generic domain names are opposites. The objective of a brand manager is to distinguish his brand from the competition. The objective of a generic domain name owner is to provide content or advertising links that are general enough to interest the visitors. A brand manager ultimately wants to build loyalty to his brand so the visitor becomes a customer and returns. A typical generic domain owner wants a visitor to click through and possibly provide enough interesting content that the visitor returns so he can click again. An exception to this is Hotels.com. They have built their brand around a generic domain name. When a person wants to find a hotel at a good price or when they want to read reviews about various hotels, they specifically navigate to the brand, Hotels.com. When a person who doesn’t know about Hotels.com (the company) navigates to Hotels.com, they are looking to find a hotel. This is a prime example of a brand being built around a generic domain name, giving the loyal Hotels.com customer and the random visitor the same valuable information, while building brand recognition and loyalty for both. In the case of Calvin Ayre’s Bodog brand, the company wants its clients and potential clients to gamble at BodogLife.com and partake in the “Bodog lifestyle.” When the brand was threatened recently, Bodog changed their domain name from Bodog.com to NewBodog.com and then finally to BodogLife.com. Although the domain name changed, the brand and messaging remained constant. In his blog, Frank Schilling argues that “Calvin should have used this opportunity to buy InternetCasino.com from Xedoc.” As much as I respect Frank, I disagree with him. First, InternetCasino.com would have been a very expensive acquisition for Bodog – probably much more than the value they would receive in return. Not only would this have changed the domain name, but it would have completely altered the brand and the lifestyle portrayed. Visitors to InternetCasino.com are looking for a place to place their bets. Bodog customers are looking for Calvin. Integrating a brand with a generic domain name doesn’t usually make sense. Yes, a brand can be built around a generic domain name, as demonstrated by the Hotels.com example. However, I don’t think a generic domain name should be used to rebuild a brand. In August, I blogged about American Airlines suing Google for allowing other companies to buy their trademarked terms such as “American Airlines.” I argued that Google should win this case because it was my opinion that another company should be able to buy generic keywords, like “American airlines,” since it isn’t necessarily associated with American Airlines. Had it been a company with a more distinctive trademark, I would have argued that it was unethical to buy those keywords. I have no legal background, so I couldn’t weigh in with a legal opinion. That brings me to a post I just read on a forum about a company I do business with that is buying not only a keyword with the name of a competitor in it, but the actual domain name of the competitor. 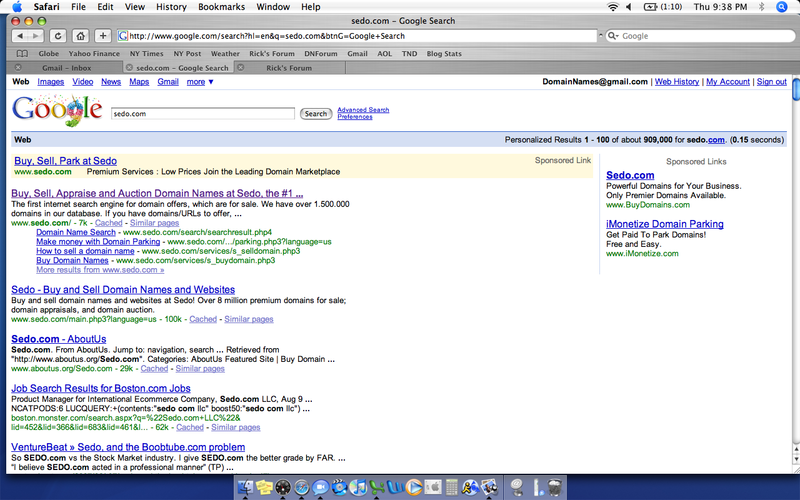 I was surprised to see that when you type Sedo.com into Google, obviously searching for Sedo, there is a BuyDomains.com paid advertisement. I don’t think this should be permitted by Google. It’s one thing to buy keywords such as “Domain Brokers” or “Domain Sales,” but I don’t think it’s right to buy the exact keyword domain name of a competitor. I am sure companies across a wide variety of industries are utilizing this practice, but that doesn’t make it right. Today’s Wall Street Journal has an article about a topic that most people in the domain investment business have been worried about for quite some time – domain theft. The WSJ article discusses the ease in which thieves can take possession of someone else’s domain name, and the detrimental effect it can have on a business that is reliant on the domain name as an ecommerce outlet or the email addresses associated with the domain name. When a domain name is stolen, the thief usually tries to sell the name quickly, profiting even before the legitimate domain owner knows the name is out of his possession. Payment is usually requested through a company like Western Union, as it can be more difficult to track the thief. Once the domain name is sold, the new owner may try to sell it for a profit, believing he received a good deal, or he may begin to develop a website around the domain name. It isn’t until the domain name servers are changed that the legitimate owner would notice something was fishy, as his website wouldn’t resolve and email would suddenly stop working. The situation turns into a bad problem because two people feel that they are the legitimate owner, and determining the actual ownership becomes problematic. Registrars don’t typically help unless there is a court order, as they would probably rather turn a blind eye than become involved in a potentially litigious situation. This makes it difficult for the legitimate owner, and it becomes more complicated when the registrar and/or new owner is located in a different country. Retrieving a stolen domain name can be a complicated task, and it may be best to enlist the assistance of an attorney like John Berryhill (quoted in the article) or Brett Lewis. 1.) Make sure your registrar password is made up of letters, numbers, and characters to make it difficult to hack. 3.) Frequently log in to your email account on the Whois record, and/or forward all emails to a regularly read email account in case you receive a notice from the registrar. 4.) Do not click on links in emails as they may be phishing attempts to gain access to your various accounts. 5.) Do not log into your registrar accounts or email accounts from computers that aren’t secure, as keylogging software could track everything you type. 6.) Make sure your domain registration is up to date. It’s always better to pay far in advance. 7.) If you have an auto-payment plan in place to pay your registration annually, make sure your credit card information is up to date so it doesn’t get rejected, causing the re-registration to fail. One of the first lessons in a real estate course is that the most important factor in site selection is the location. As the famous saying goes, “location, location, location!” If location is the most important factor in where to purchase real estate, why wouldn’t the domain name be one of the most important factors in where to open an online business? Why is it that most business schools merely gloss over the domain business? I don’t believe a bad domain name can break a company with a good business model. I think a bad name can be detrimental, but it’s nothing that good SEO, Keyword advertising and old fashion marketing can’t fix at a high cost of course. I do believe that a great generic domain name can position a company much better, and it can make it easier for customers to find the company. If two companies offer the same product, same customer service and fulfillment, and similar advertising, I believe the company with the better domain name will see better results both in terms of search engine placement and natural traffic. I just received an email announcing the first cut of Moniker’s auction list for the October 2007 T.R.A.F.F.I.C. Conference. This is the first cut of more than 3,000 domains included in the auctions. From past experience, I believe there will be somewhere around 300 domain names in the live auction, and several hundred names in the silent auction. As always, there are some high profile names in this list. As we get closer to the event and the final list is distributed, I will give my opinion of some great names at low reserves.